As a writer and actress I love to discover stories and find ways to tell them. The Bible has always been my biggest source of inspiration. This year it’s exciting to be celebrating 400 years of access to the scriptures in English (I’m sorry to say my Hebrew and Greek aren’t up to much). In my work with Spring Harvest, as their head of creative arts, I’m thrilled to be working together with Biblefresh to celebrate this milestone by staging The Good Book Tour in cathedrals and churches. It will be a night of many books, all inspired by the greatest one of all. As well as performing a little of my own work, I will be reprising my role as part of Lacey Theatre Company, founded by Rob Lacey. We will be performing material from his book The Word on the Street (formerly The Street Bible, Zondervan), alongside passages from the King James Version, highlighting how both were written to be spoken aloud and come alive in performance. And drawing attention to the way scripture can be retold for every generation, but also lasts beyond lifetimes. We’ll be joined by Derek Wilson, author of The People’s Bible: the remarkable history of the King James Version (Lion Hudson), who can give us fascinating insights into how it all came about, and the evening will be hosted by Gerard Kelly, who will be performing some of his poetry and sharing thoughts about the impact of the English scriptures on our culture of scripture. His books include Spoken Worship (Zondervan) and Intimate with the Ultimate (Authentic) amongst many. It’s going to be a lot of fun hitting the road with this bunch. From the 4th February until the 13th February we’ll land in Brighton, Peterborough, Wakefield, Manchester, Stafford, Malmesbury, Guildford and Exeter. 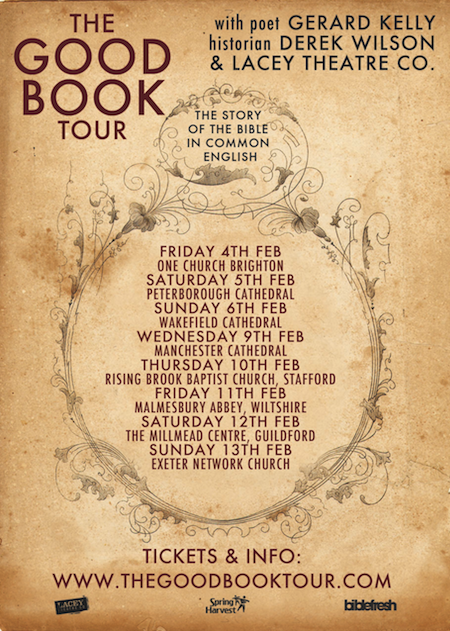 All the information is at www.thegoodbooktour.com, tickets are only £5, so for the price of a couple of pints you get a great night of books brought to life. If you’re based near enough to a venue and want to help us spread the word (pun intended) then get in touch via the website or facebook and I can send you posters or flyers. We think it’s a night that book-lovers will enjoy, as will most people, we hope. Join us if you can. Alas, a shame you can’t make it over the Border to Bible-loving Scotland! However, I hope you don’t mind if we at GLO blatantly plagiarise your idea of the alternate readings with the ‘Word on the Street’. We are planning an event in Motherwell in March to celebrate the 400th- and that sounds like a very good way to illustrate the ‘contemporary’ nature of the King James version! PS I don’t know if anyone yet has had any comments from customers about the fact that the plethora of 1611 reprints all, of course, feature the Apocrypha as published in 1611, and not removed until the 1800s or so? I am eagerly waiting for the first irate ‘Reformed’ customer to complain about the inclusion…..!! « Planet BB: The Boys’ Brigade Around the World – now available!